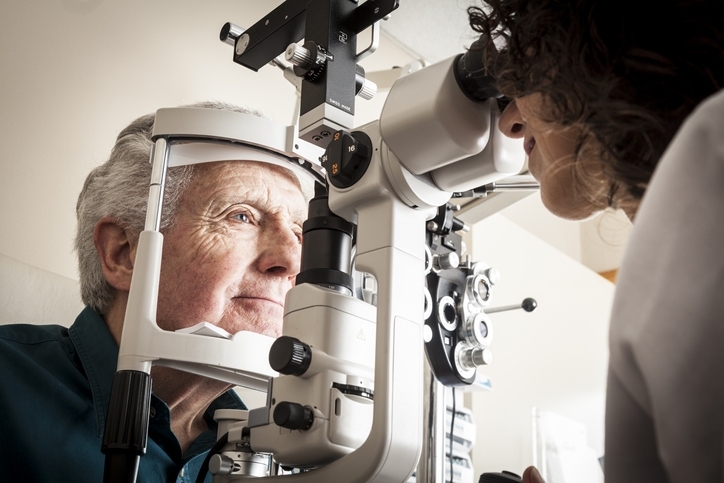 Learn some of the most common vision issues in seniors and when to seek help. If your aging relative has been given a diagnosis of age-related macular degeneration, it’s likely you’ll have multiple questions and concerns. And you’re not alone; approximately 11 million people in the U.S. have been given the same diagnosis, and that number is anticipated to double by the year 2050. The Butler senior care professionals at Absolute Companion Care are on hand to highlight the details you need to more fully comprehend this disease and how to best assist your elder loved one. Age-related macular degeneration (ARMD) is a disease wherein the center of the retina (the macula) is damaged, having an effect on central vision and the details required in reading, driving an automotive, watching TV, and distinguishing people’s faces. It is the #1 cause of irreversible central vision blindness in older adults, having an effect on 1 out of every 3 adults over age 75. It’s important to understand that macular degeneration will not usually bring on full loss of vision; peripheral vision remains undamaged. What are the two categories of macular degeneration? Wet ARMD: Accounting for roughly 10 – 20% of all diagnoses, wet age-related macular degeneration generates a build-up of drusen – deposits of fat – and an irregularity of the blood vessels under the retina. Both of these indications together lead to damage to the retina. Wet ARMD can advance quickly and bring about extreme and irreparable central vision loss. Dry ARMD: Dry ARMD comprises the majority (up to 90%) of macular degeneration diagnoses. As with wet ARMD, drusen appears below the retina, causing a thinning of the macula and eventual central vision loss. Advancement is more gradual in this form of ARMD, but it can advance to wet ARMD. In both forms of ARMD, early diagnosis and continual monitoring are vital to protecting remaining vision. All elders need to get eye exams at least on a yearly basis. To identify ARMD, the eye doctor will dilate the eyes and perform a fundoscopy, fundus photography, and a visual acuity test. If ARMD is suspected, an added assessment, a fluorescein angiography, will likely be required. In this test, dye is injected to discover any leaking in the blood vessels. The Amsler grid eye test is a quick and easy tool that can also be tried at home as a first step in figuring out if ARMD might be a possibility. What treatment options are possible for ARMD? Is it possible to prevent macular degeneration? Putting into practice healthy lifestyle decisions, like stopping (or not starting) smoking, exercising regularly, adopting a wholesome diet that includes plenty of vegetables, fruits, and fish, keeping a healthy weight and normal blood pressure, and wearing eye protection when outdoors, such as sunglasses and hats, may help reduce the risk of developing ARMD. For a trusted partner in care for an elder with macular degeneration to provide help with transportation, medication reminders, meal preparation, light housework, and much more, contact the Butler senior care team at Absolute Companion Care any time at 410-357-9640.